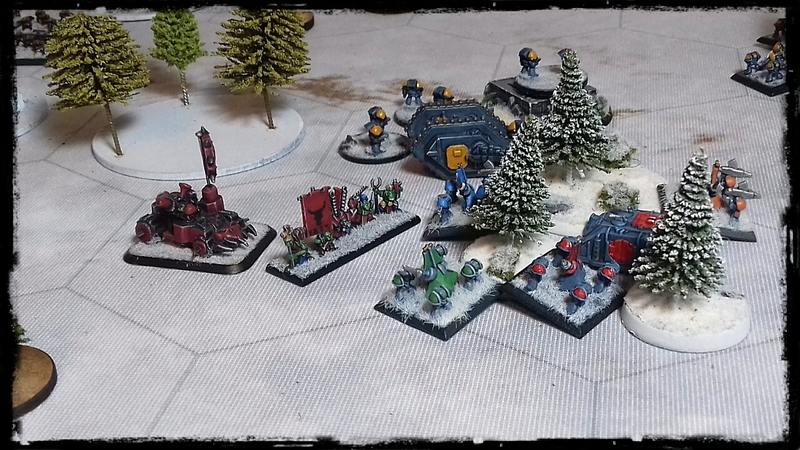 I have recently been playing a lot of Deadzone by Mantic Games. I bought the first version of the boxed set last year and decided at the time to stick with the original ruleset, however, after reading the version 2 ruleset I have decided to upgrade to the new and improved version. To help me to learn the new rules before I can get another gaming session in, I have played a couple of solo games. It not only took me very little time to get to grips with this more elegant system, I had some very interesting battles! 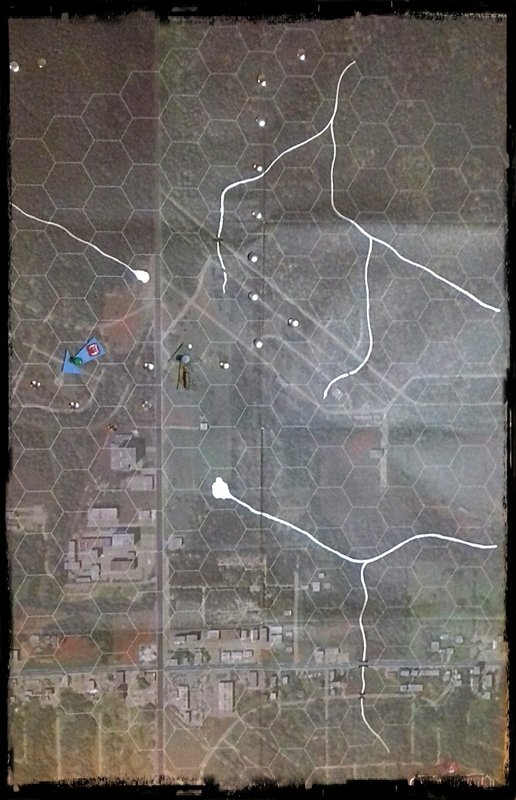 During the last game, I rolled to find out which scenario to play and came up with ‘Patrol’ mission. Now one of the things I liked about the original version was the secret missions and they are still in version 2. After selecting a scenario you can also choose to roll on the relevant ‘Secret Mission’ table. The Plague rolled the ‘Staking a Claim’ mission which meant they scored double victory points for objectives but only half for killing enemies. 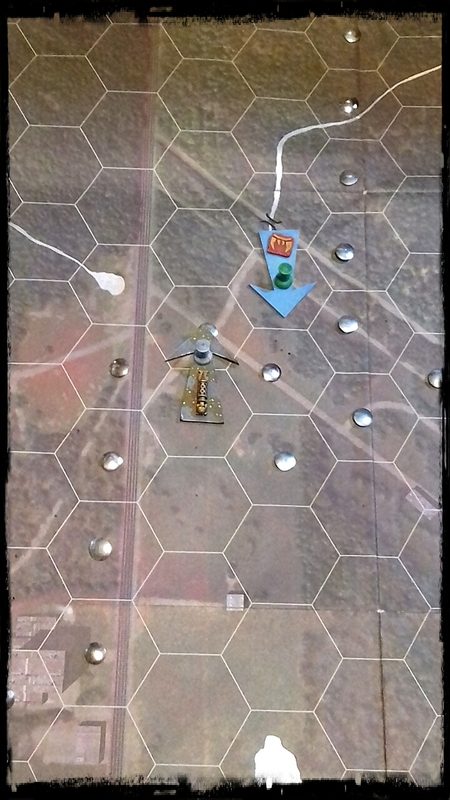 The Marauders rolled the ‘Assassination’ mission, giving them double victory points for killing the enemy leader but no points for holding objectives. 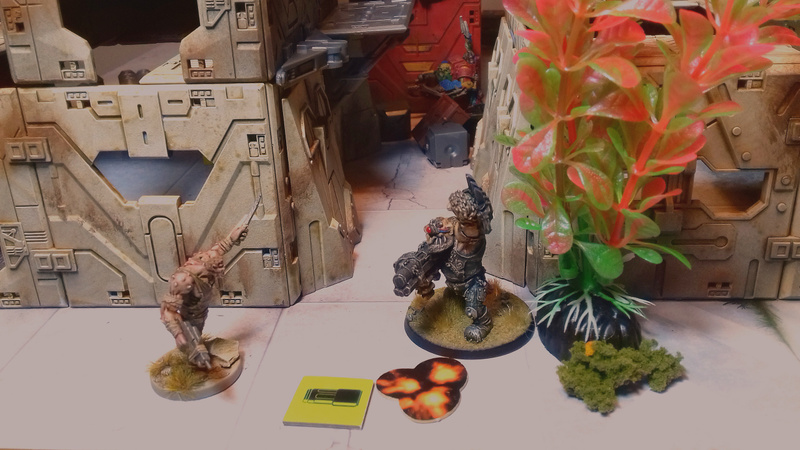 A stage 3 ‘ghoul’ throws a stun grenade before charging in to engage the marauder hulk in hand to hand. 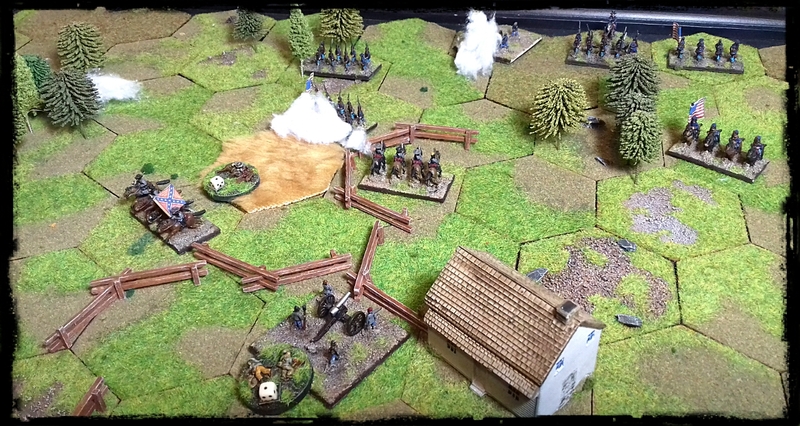 Although they successfully eliminated the Stage 1 leader, the Marauders were unable to stop the Plague forces from dominating the battlefield objectives and the foul forces won 14 to 11 VPs. 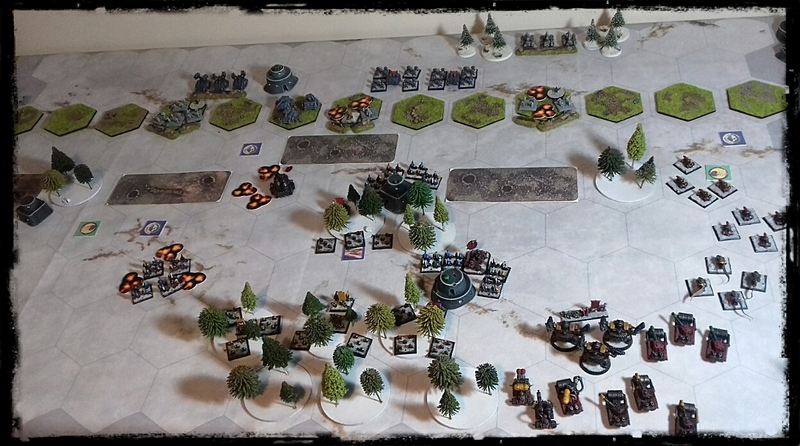 It was a very interesting game and more importantly, I have got the rules pretty much down to pat ready for my next opponent. The keen-eyed among you may have spotted the lack of Mantic orx on the board. Due to a lack of funds I want to utilize the models collection that I already own as much as possible and so have decided to replace the Enforcers with my Iron Eagle space marines and the Marauders with my Blood-axe kommandos. I also intend to repurpose some more minis and do some kit-bashing to boot! Hearts of oak are our men!.. 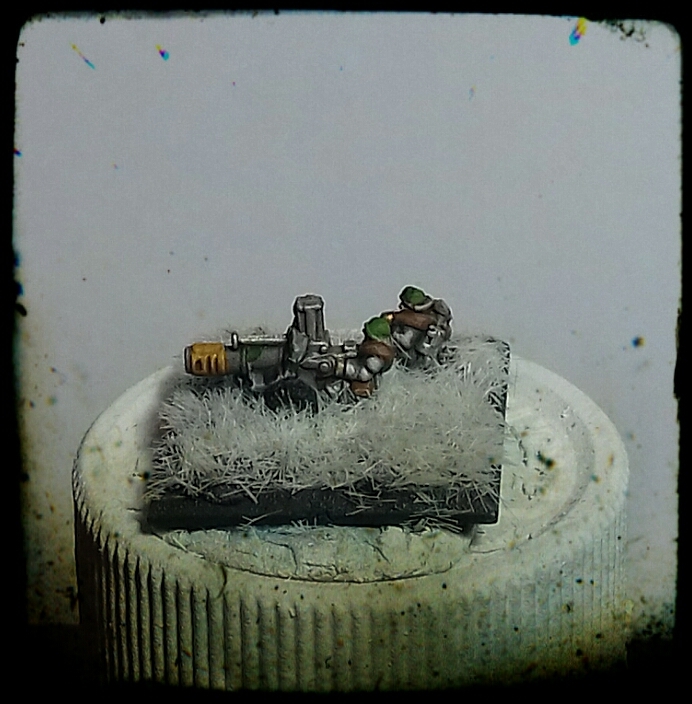 This miniature is Captain ‘lucky’ John from Warlord Games, which I believe is the exclusive miniature that comes with the Black Powder rules. 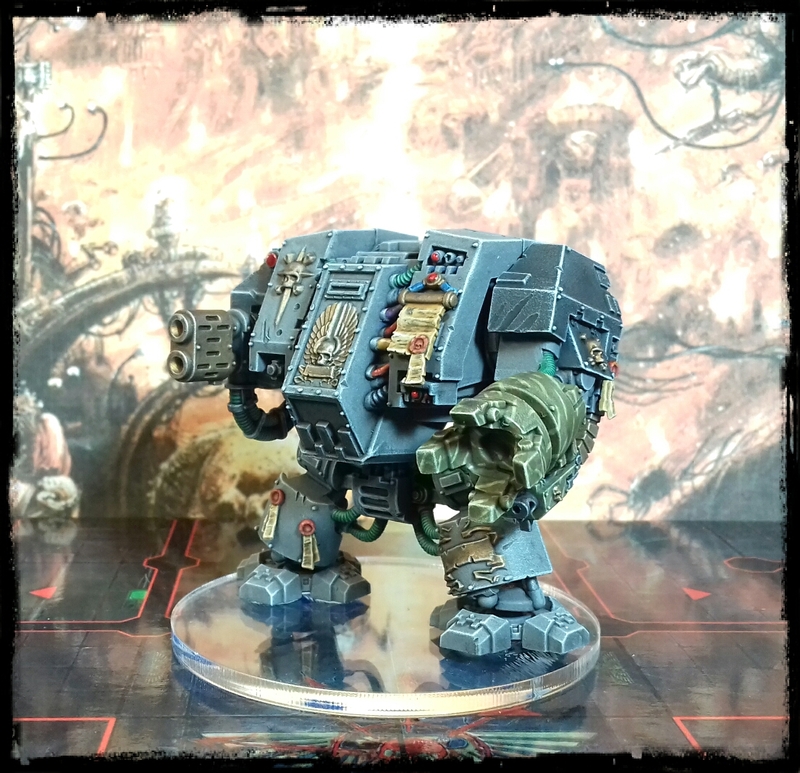 It is ,in my opinion, the best mini that Warlord has ever produced. 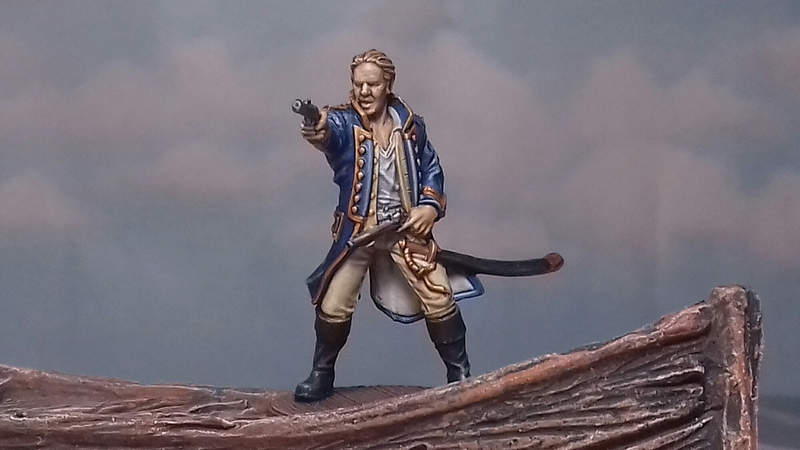 I do not know who sculpted him, but the likeness to Russell Crow as Captain Jack Aubrey, from the fantastic movie Master and Commander, is uncanny and he was a pleasure to paint. Finally we have some ‘jolly jack tars’.. 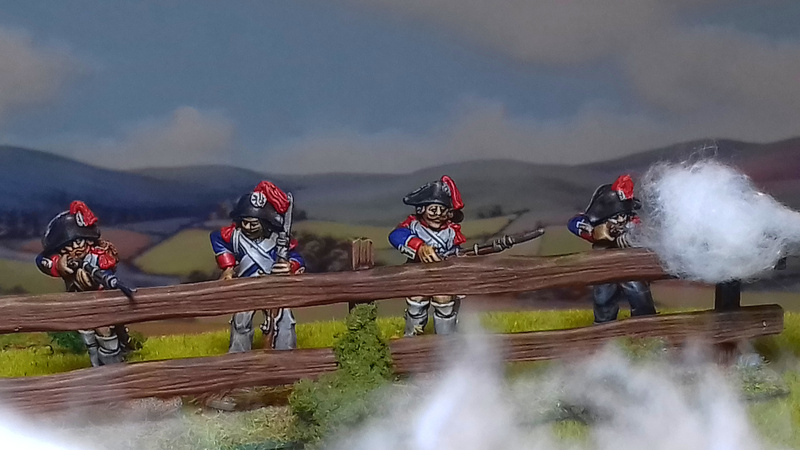 These good fellows are from Perry miniatures and very characterful and dynamic models they are too! I still have a few more naval officers, midshipmen, petty officers and ratings left to paint, but I have been developing a ‘quick-paint’ method for doing these more efficiently. 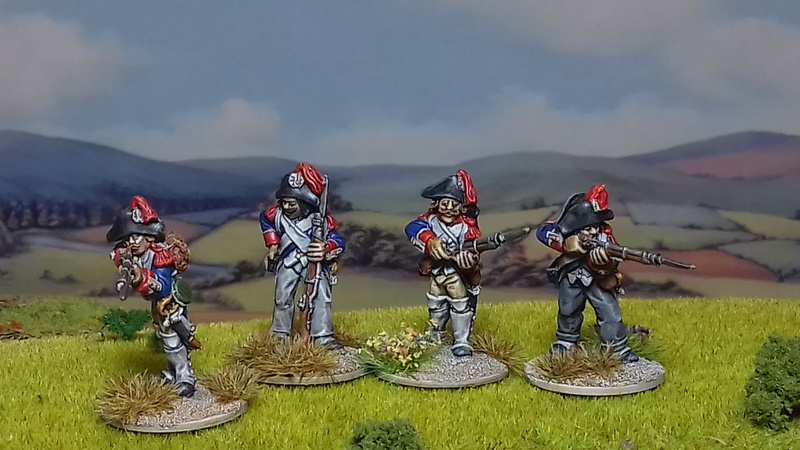 I have been quietly beavering away at my paint station over the last 6 months and my focus has been mainly upon my Napoleonic miniatures collection. 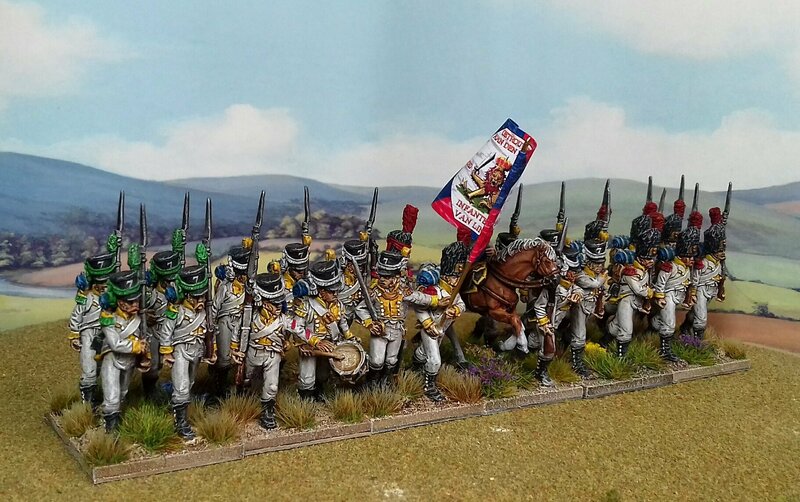 I had always wanted to paint and collect miniatures from the Napoleonic period but could never bring myself to paint so many hordes of troops for battles in the ‘Grand Manner’. 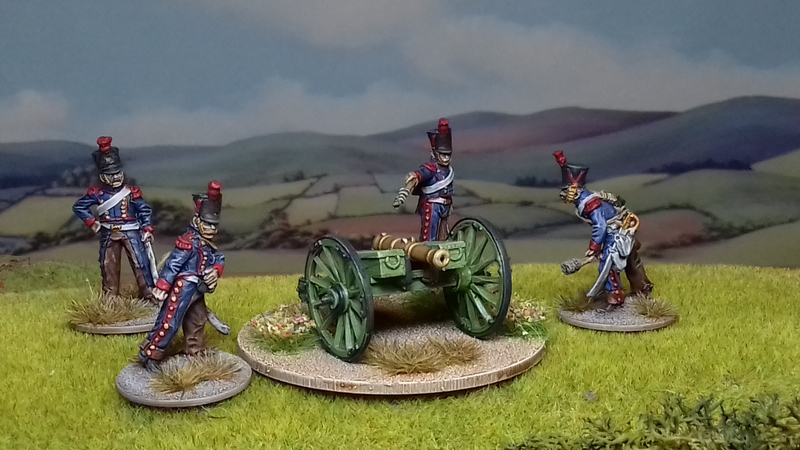 My first (and very likely only) attempt at painting up a full regiment of Napoleonic miniatures. This is the 7th infantry regiment of the ‘Kingdom of Holland’. 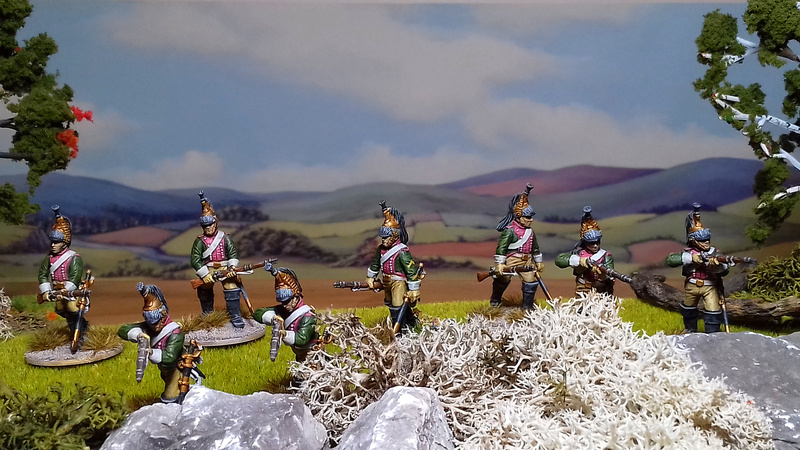 I also wanted to be able to paint up a whole plethora of different troops from any and all of the nations who took part, something that neither my bank account nor sanity could handle at regimental level! 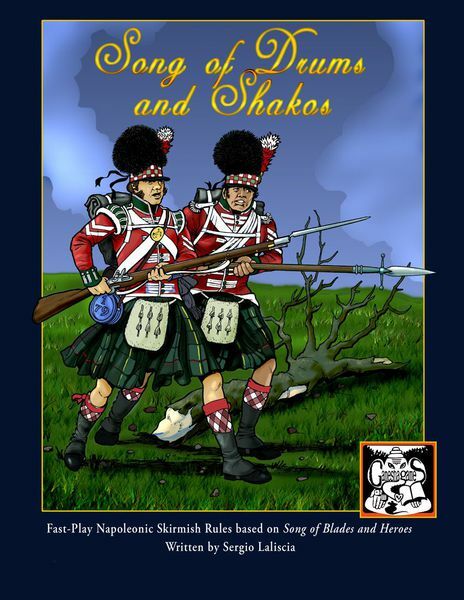 I am a big fan of the ‘Song of…’ family of games and Drums & Shakos is no exception, it also allows me to buy small numbers of miniatures that can be painted up in short order ready for the battlefield! 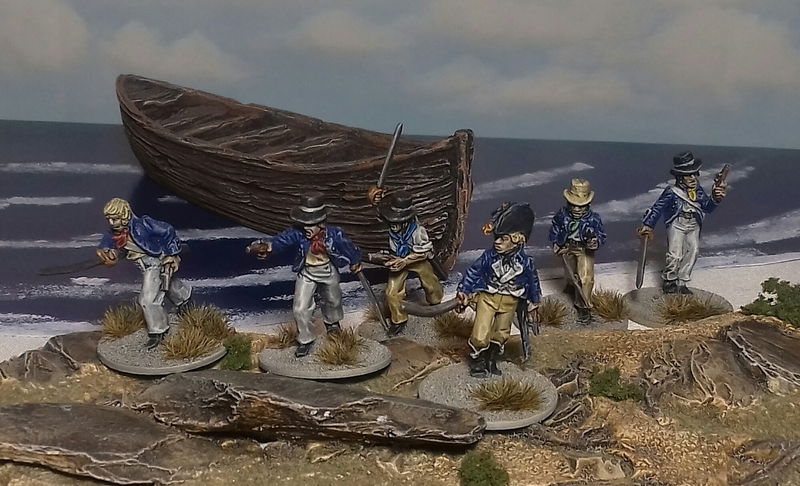 In my first blog post (see here) I exhibited the first troops I painted, a Royal Navy landing party of marines. The shore based operations and cutting-out expeditions conducted by the navy are so interesting and using them as the basis for my collection allows me to tie together all the different and disparate nations, as the navy took part in operations all over the world throughout the Revolutionary and Napoleonic periods. 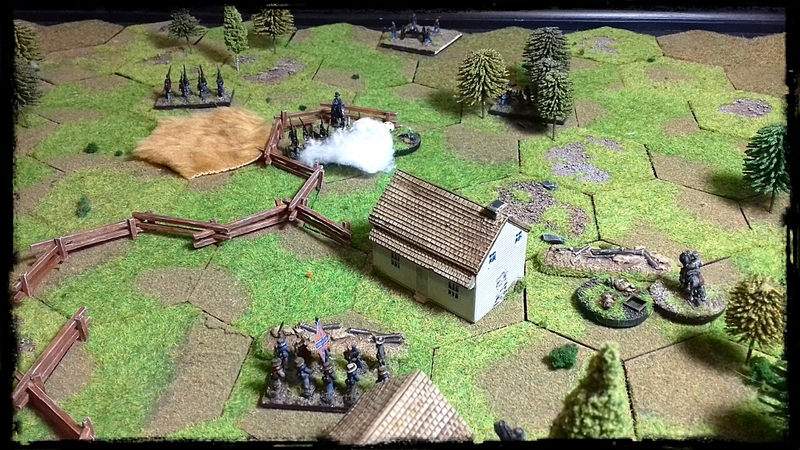 I have already had a few games of Drums & Shakos, one of which saw French Dragoons successfully preventing the rescue of a British spy and another where a landing party stormed a French shore battery. The struggle for Ardera IV raged on through what was known as the cold year, which is caused by the rather strange, elliptical path by which the planet orbits the main sun-star Artemis. An entire single orbit of the Artemis sun-star takes 2 terran-standard years, one of which takes Ardera IV three million miles away, dropping the planet’s atmosphere to freezing temperatures. 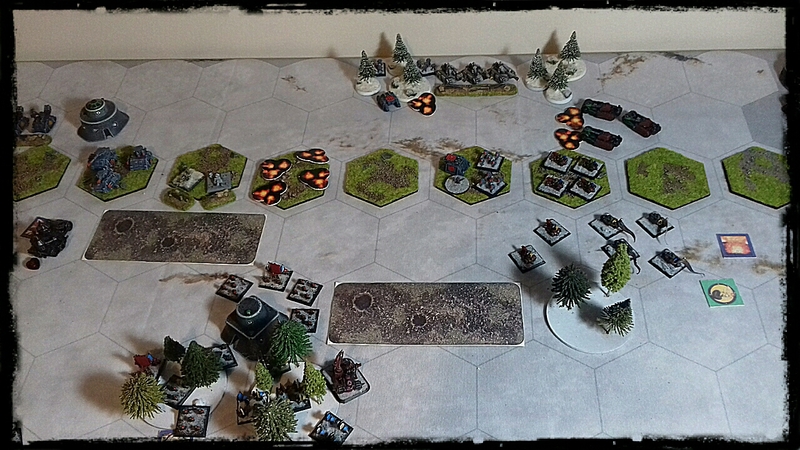 However, the sub-zero temperature did nothing to quell the bellicose nature of the orks and fighting continued at a relentless pace. I decided to create another level of attack to allow me to use more titans and superheavy vehicles. By using 625 tons of supplies an army can conduct an All-out assault, using 2500 points to build their army. In the first battle I allowed 2000 points for the defenders, but I may have to think about that. The Orks conduct an all-out assault from their bridgehead at the Malcador river. 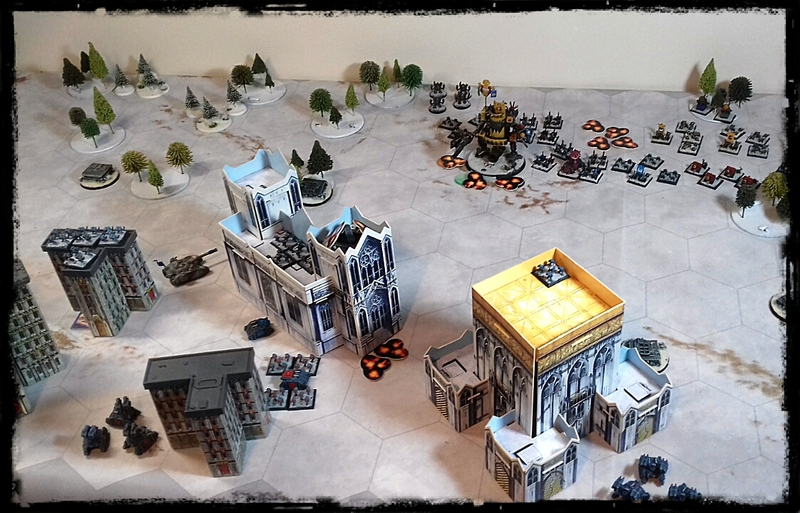 The Imperial defenders and their defence-works were deployed first. Dug-in, along the fortified highway, they covered a dense network of minefields and razor wire, creating deadly kill boxes. The ork horde deploys to assault the Imperial positions..
On The ork left flank Warboss Eisengore orders forward his heavy armour.. 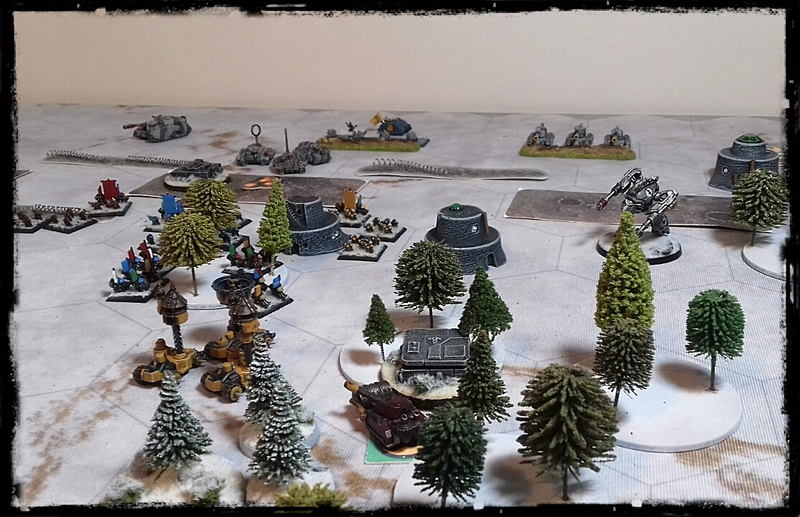 In the centre the ork gargant, ‘Owd Yella’, takes heavy fire from Pack-Hunter ‘Kessler’ and Shadowsword ‘Damocles’. An ungodly armour battle ensues over the open steppe and ‘Owd Yella’ is laid defenceless with power shields down and all weapon systems destroyed, burning but still unbowed. 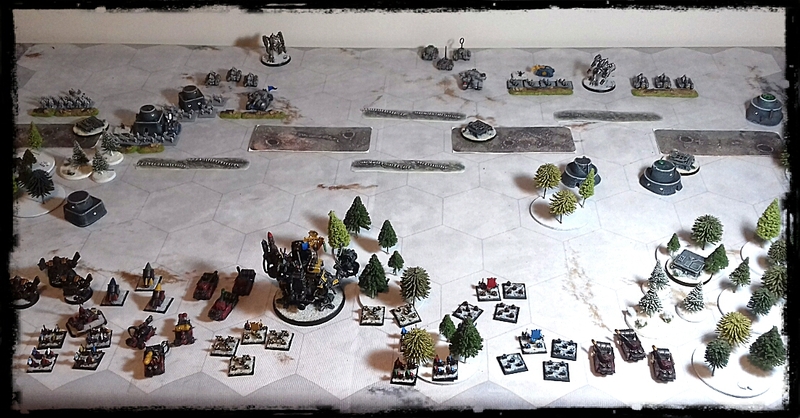 With the Ork’s all-out assault failing with much slaughter, including the near destruction of the scrap titan Owd Yella, the Imperium hit back with a major attack at a vital crossroads. The Iron Eagles space marines assaulted the ork positions from the south-east. 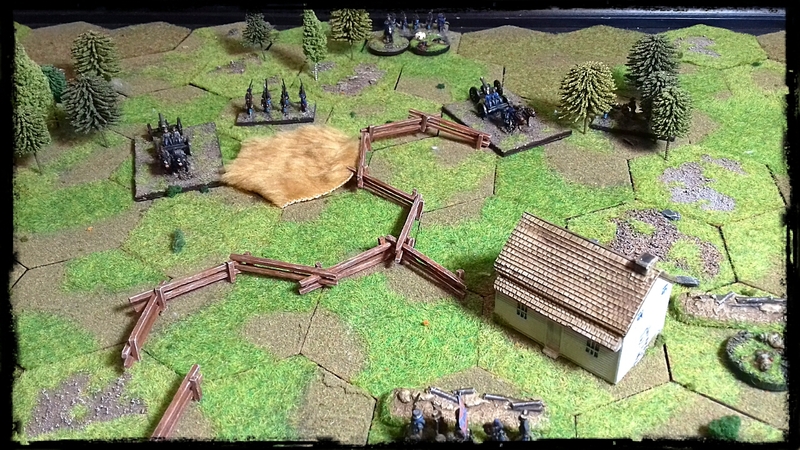 Ork defences were light, with the dug-in infantry stretched over a wide front. 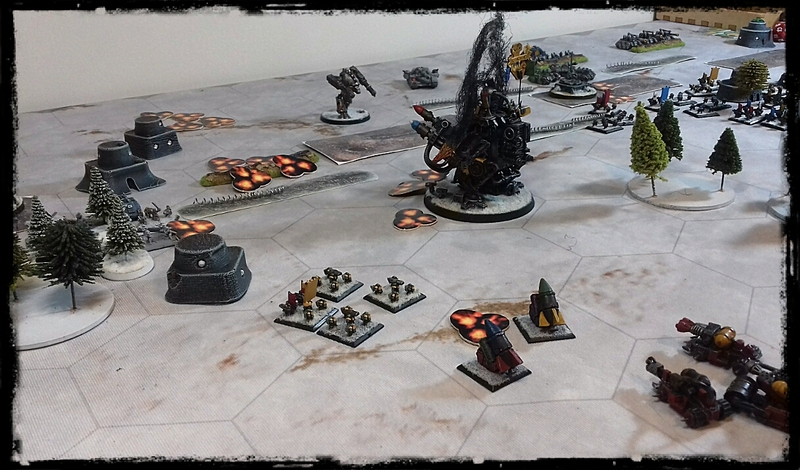 The adeptus astartes conducted a precision strike on the right flank of the ork forces. The ork defences were no match for the ferocity of the space marine onslaught and the line was rolled up with contemptuous ease. 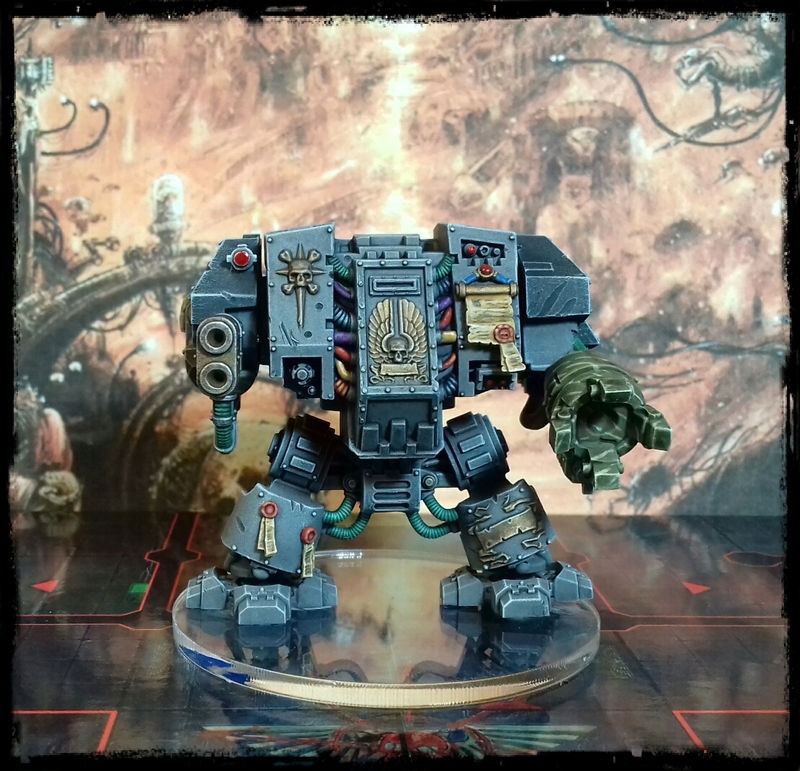 When the ork warboss was slain by the Iron Eagle commanders, the greenskin’s will to fight was sundered and the marines ran down the scattered survivors. With an astounding victory at the crossroads, the forces of the Imperium managed to push the orks back to the natural choke-point between two major rivers. A brilliant strategic victory. Since my last post, things have been progressing rapidly with my Ardera IV campaign. After their unsuccessful assault on the maglev line, the greenskins struck the northern districts of the Hedraeos agri-refinement complex. 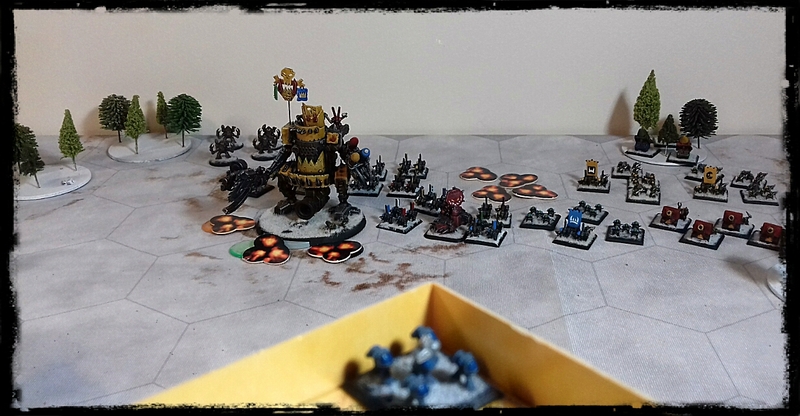 Riding upon his newly built gargant ‘Old Yella, Warboss Snaggle-tooth lead his Deathskull mob against the Imperial defenders. 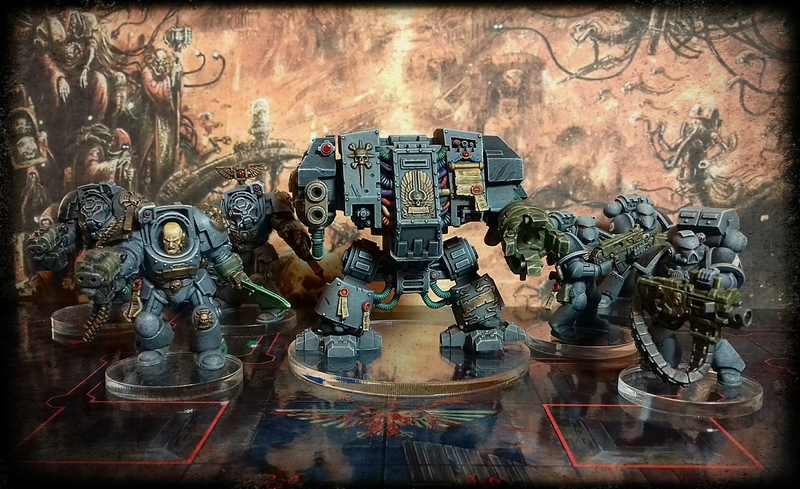 Following their warboss, upon his favourite scrap-titan, the Deathskull clan races towards the Imperial defence line. Impious Wrath lines up the shot. Impious Wrath all but destroyed the ork gargant, but the green horde managed to swamp the marines, capturing their objectives and ripping out the heart of the Imperuim’s defences. This battle gave me an opportunity to try out some ideas of how I’d like titans to work, including limited maneuverability, multiple weapon systems and void shields. I think that I have been able to refine the way they will be handled in Memoir 40k quite nicely. The next assault was initiated by the orks yet again, this time in an attempt to cut off the salient in the centre of the line. 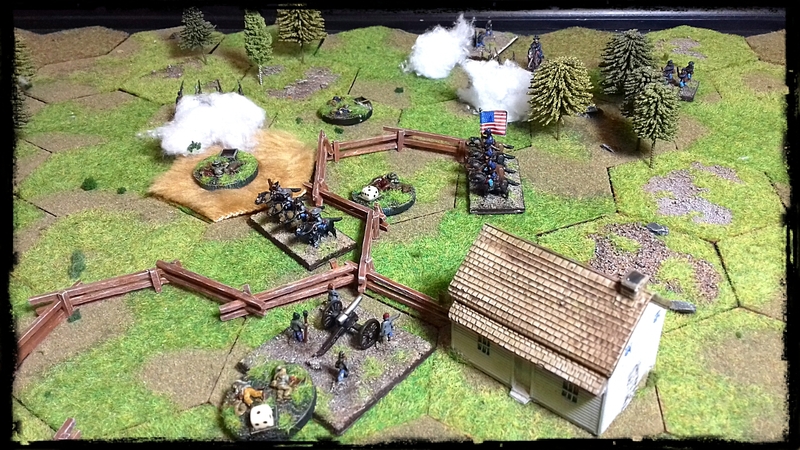 I got too caught up with playing the next battle (yet another assault on the maglev-line). 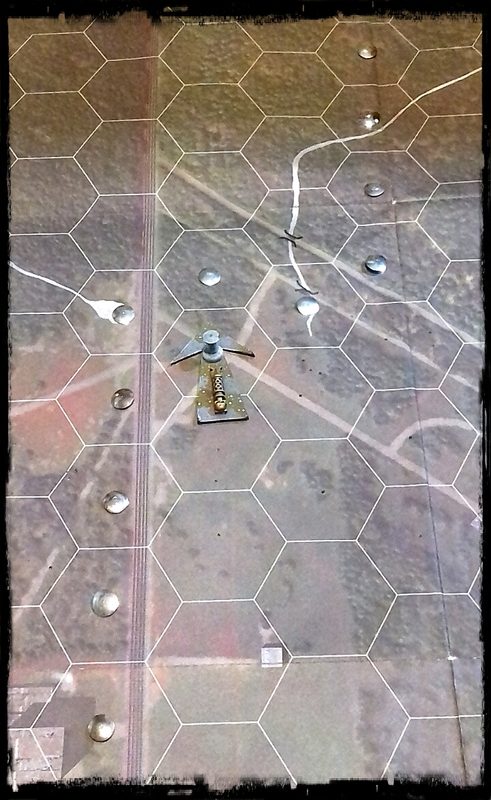 The imperial guard conducted a dogged defence and although they took heavy casualties, managed to clinch a hard-fought victory, repelling the ork assault and securing the flank of the ‘Maglev Cauldron’. 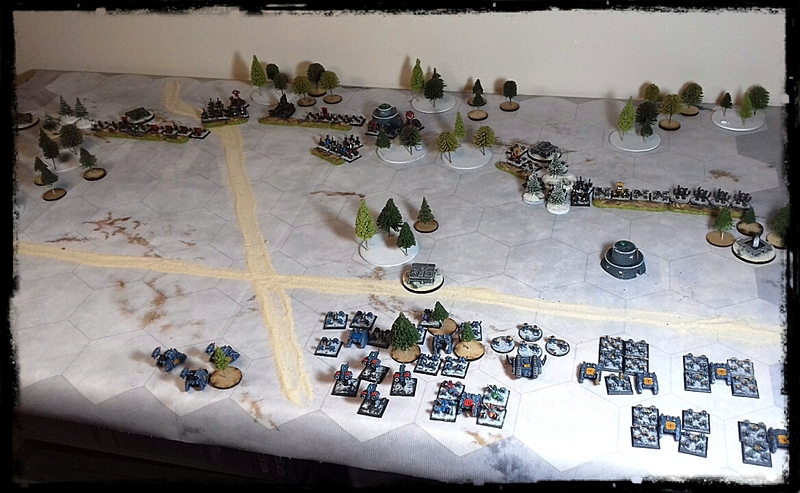 Inspired by the WWII campaign on Grid-based Wargaming blog, I have started a Memoir 40k campaign of my own. 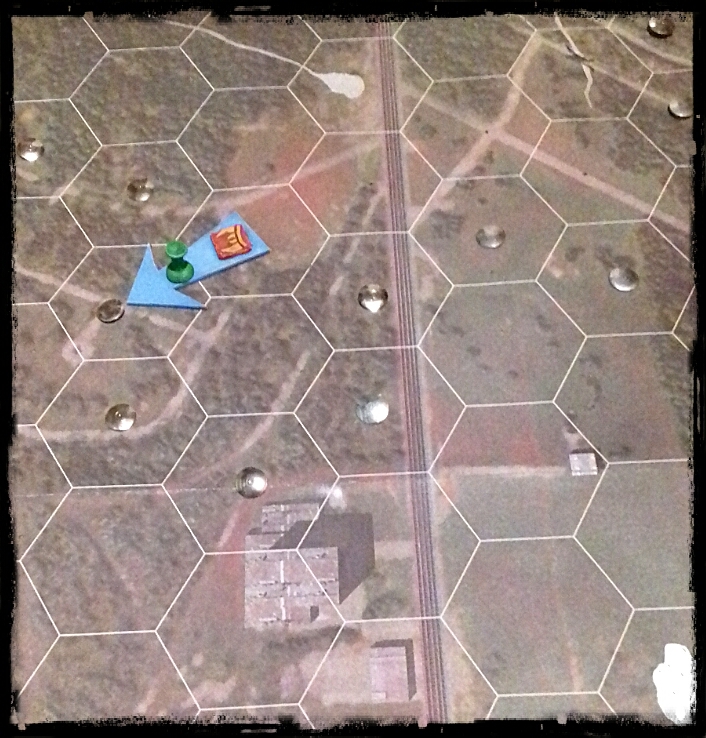 In the blog post, which can be seen here, a front line is created on a gridded map and the amount of sections I by the enemy decides the amount of supplies each army has. 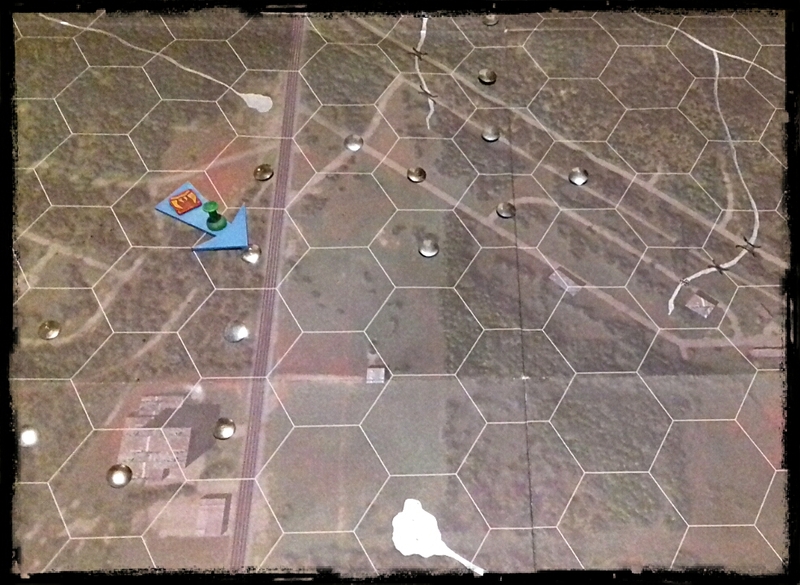 Campaign map – the pins mark out the front line, with the hexes containing pins being no-mans land. 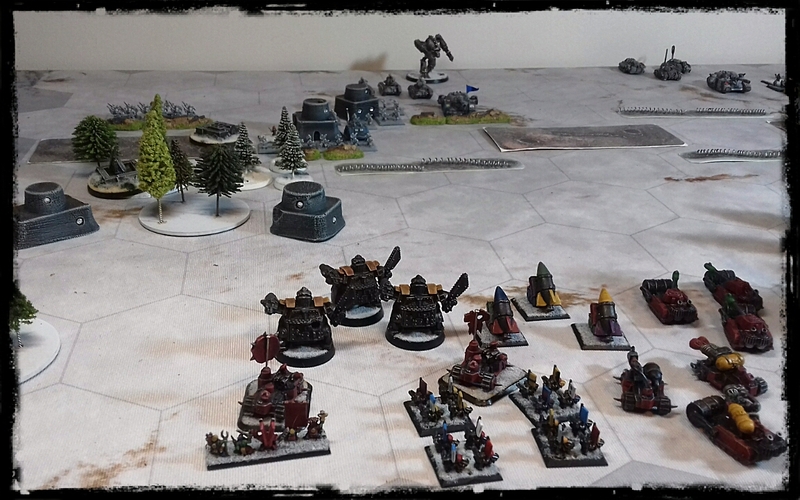 The north-west section of the map is occupied by the ork invaders and the south is held by the imperial defenders. I first worked out how many tons of supplies each army starts the campaign with. Each side will expend supplies by making attacks somewhere along the frontline. Each campaign turn I pull a poker chit from a cup, blue for imperials and green for orks. If a green chit is pulled the orks must make an attack, if it is blue, the imperials can choose to attack or postpone the attack by putting the chit back and pulling a new one. 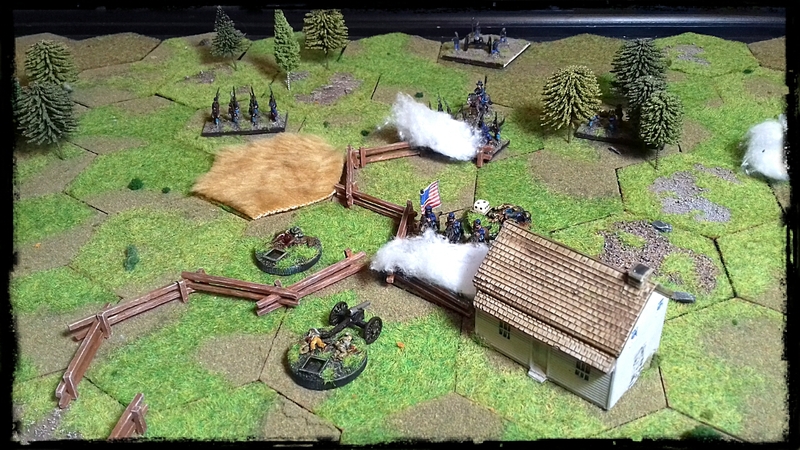 If a blue chit is pulled a second time, high command insists upon offensive action and they must conduct an attack. The attacking force chooses which hex to attack and whether to make a major or minor attack. The tons of supplies used is multiplied by 4, giving the number of points for picking the attacking army (using Epic Space Marine cards). 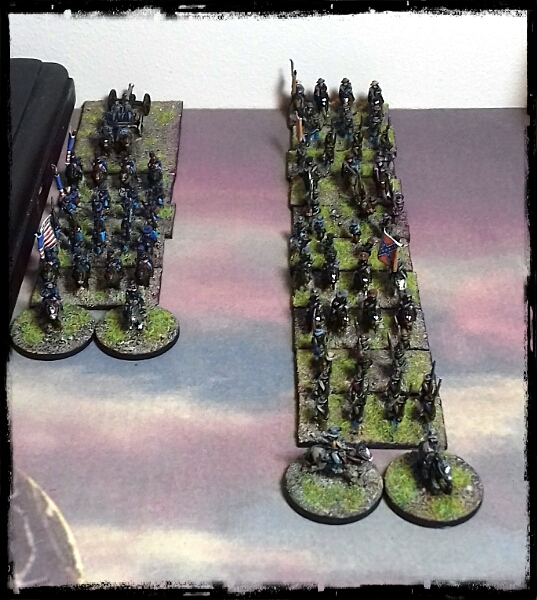 The defending army has 1500 points which can be spent on both units and defenses. 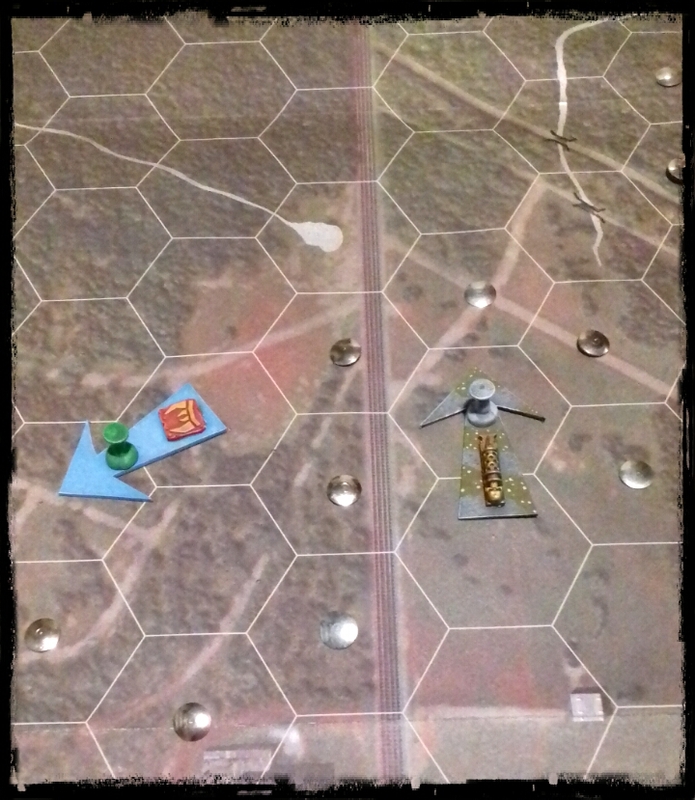 Defenders expend no supplies for a battle. 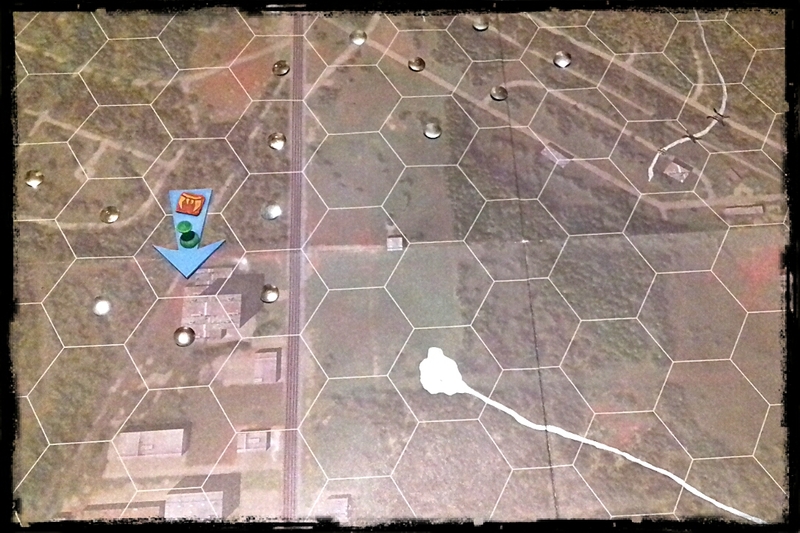 The orks begin by conducting a major attack on the eastern flank of the frontline. They were victorious, pushing the frontline forward, encircling a pocket of imperial troops. 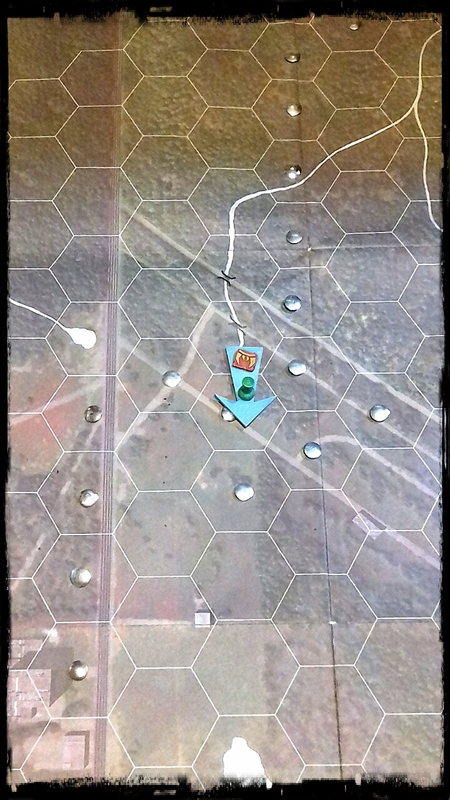 A space marine battlegroup made a minor attack creating a salient and hoping to drive for the crossroads between two rivers. 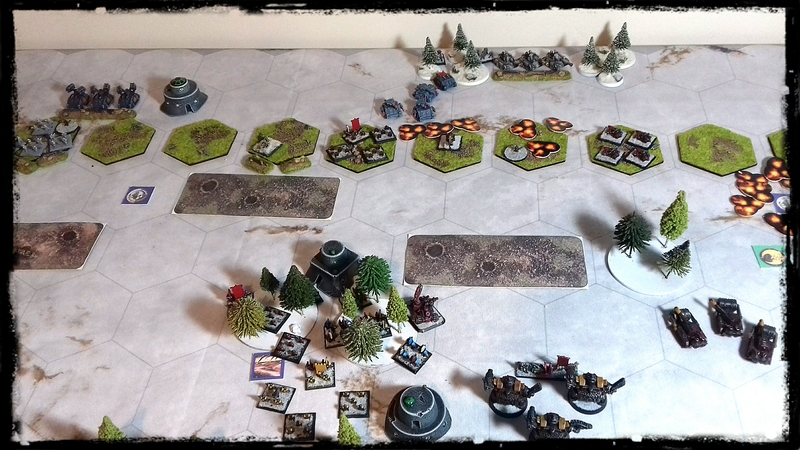 The orks send a major attack forward hoping to encircle and cut off the imperial offensive. 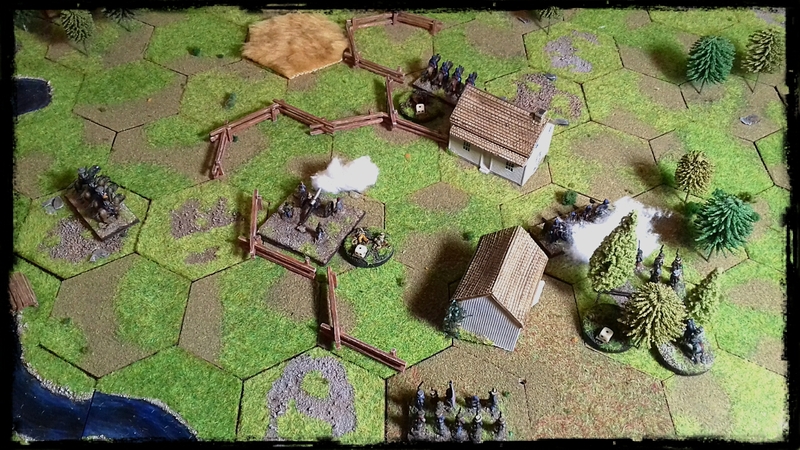 I created a battlefield based on the terrain featured in the hex on the campaign map. 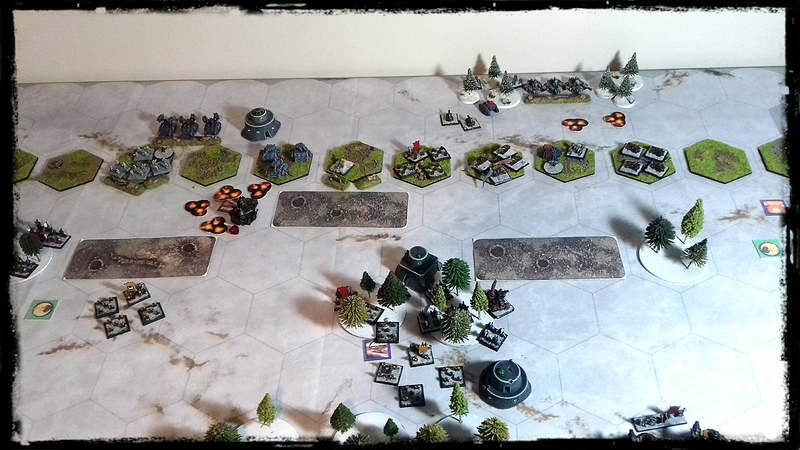 My new battle-mat has arrived featuring 3″ hexes in snow effect, so it is most definitely a winter war. 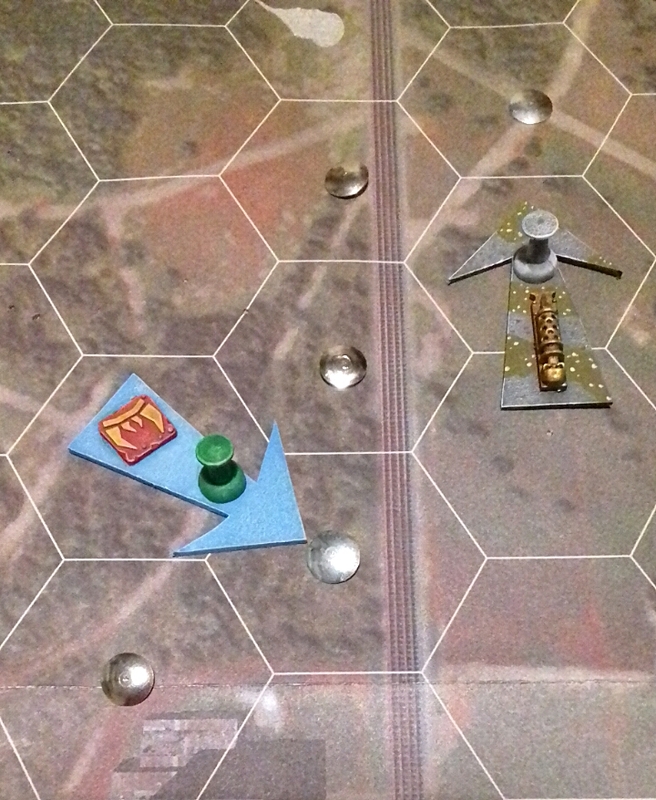 The line of green hexes running the length of the board represents the maglev line ( shown in the map hex), which is a raised embankment. The orks are deployed, emerging from the wood line. 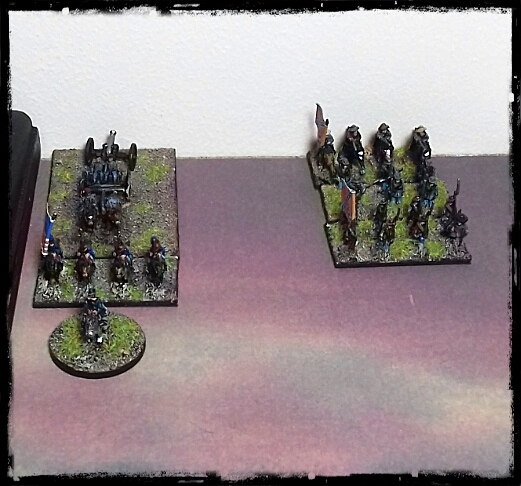 The starting deployment with the imperial defence anchored on the maglev line. The ork deployment was randomized by rolling a D3 to choose which section they were deployed in. Ork infantry pushes forward in the centre, taking heavy fire from the imperial artillery. 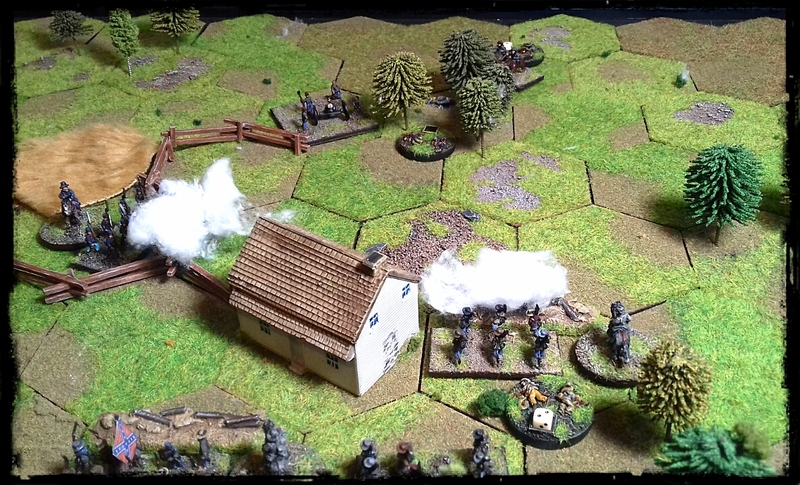 Meanwhile buggies and bikes sweep around the right flank to secure one of their ‘Take & Hold’ objectives. 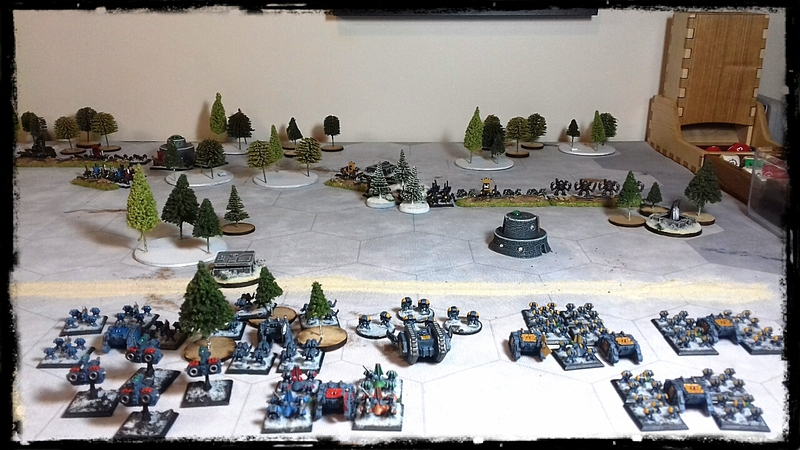 The orks keep the pressure up on the imperial left flank, after securing there ‘Take & Hold’ objective. Imperial artillery rains down on a nobz mob which had reached the maglev embankment. Space marine tactical squads endeavor to hold back the rampaging ork buggies whilst the predator tanks engage the ork battlefortress. 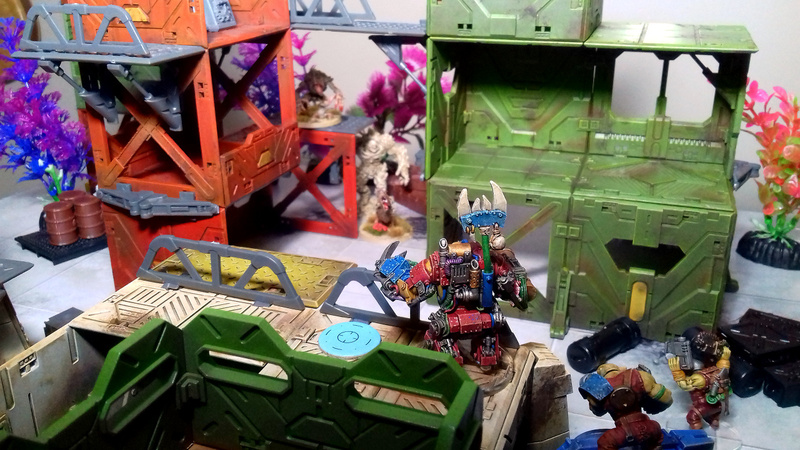 The orks push forward on all fronts, capturing yet another ‘Take & Hold’ objective. 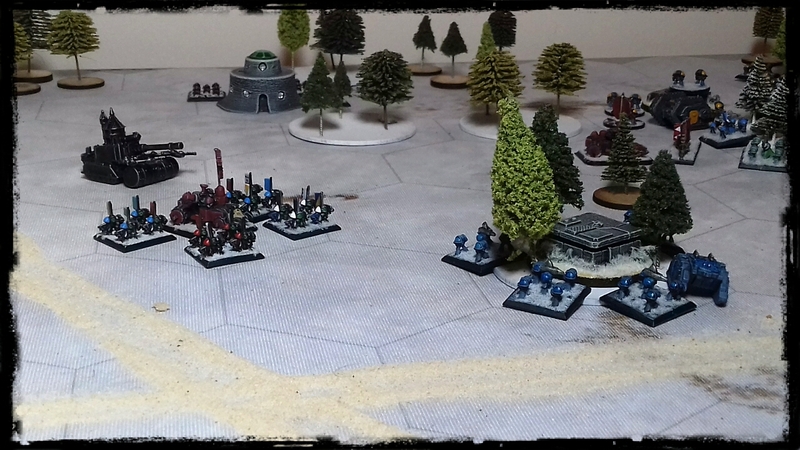 Imperial firepower pummels the battlefortress to little effect. 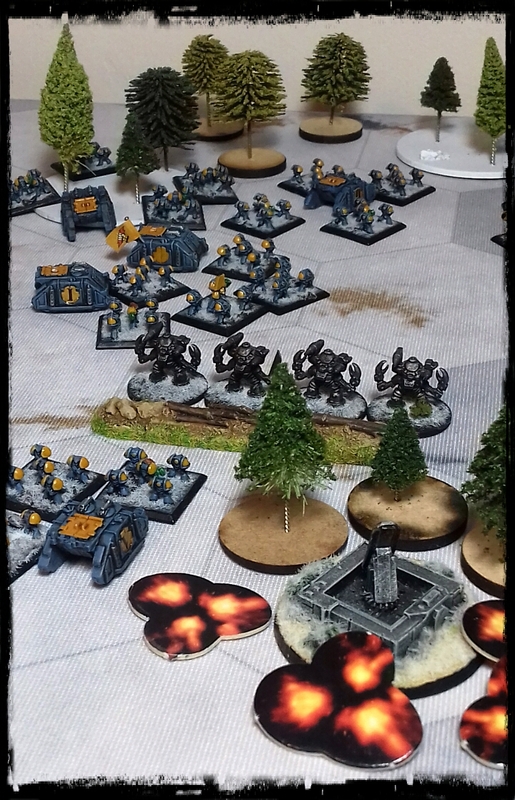 The battlefortress is finally destroyed by massed heavy artillery fire, securing victory points for both killing a unit and achieving a ‘Cleanse’ objective. Even as the greenskin stompers move forward to engage, space marine counter attacks and successful artillery strikes on both ‘Bombard’ objectives steal victory from the jaws of defeat for the Imperial defenders. So the intrepid forces of the Imperium are victorious, stopping the green horde in its tracks. Using the imperial guard as a solid defensive line whilst the Iron Eagles space marines were kept as a mobile reserve to conduct counter-attacks, worked really well. 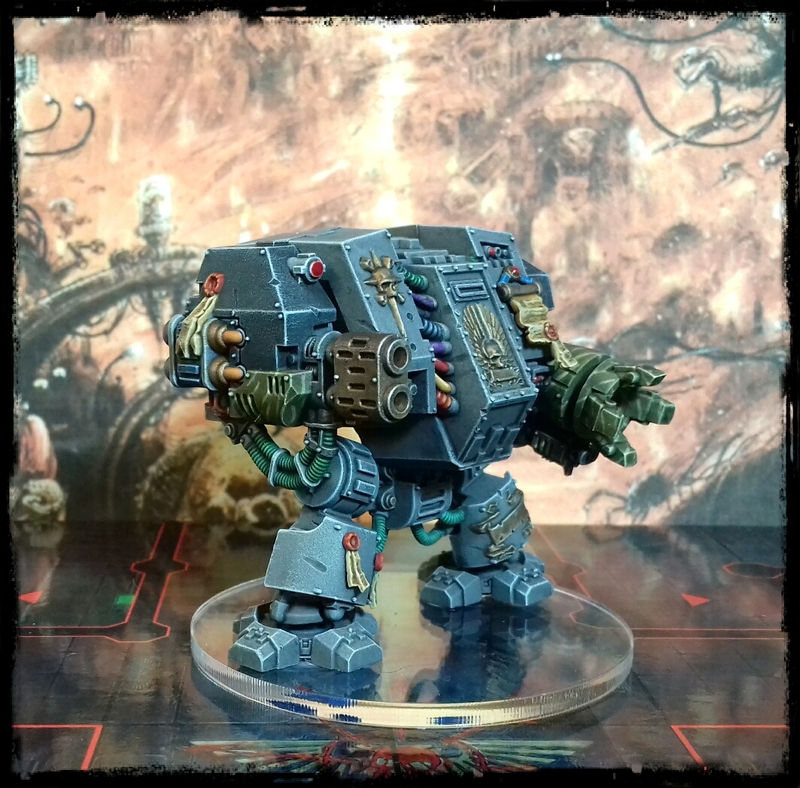 Having read Azazel’s latest Decemb-uary post, which is chock-full of fantastic paint jobs and brilliant conversions by fellow participants, I was inspired to get myself into gear and finish off the final touches to my dreadnought. In battle the Iron Eagles are a terrifying site to behold. I’d like to take this opportunity to thank Azazel for coming up with the idea for this painting challenge, I’ve wanted to do something like this for some time but things either got in the way or the subject didn’t really fit with the projects I was working on at the time. Fortunately, with this fellow sitting around waiting for a lick of paint I was able to join in the fun! My Decemd-uary painting challenge (inspired by Azazel) has not progressed past my last post, but it has at least helped me to get back into painting mode. 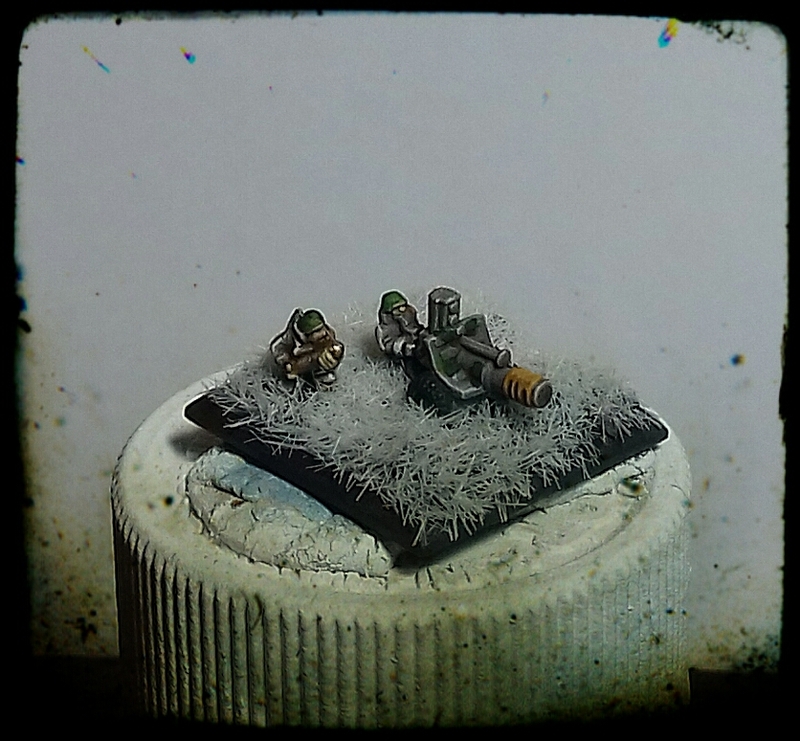 With all the fun I’ve had with my Memoir 40k project, I decided to add a few troops from my Epic bits box. I picked up a single sprue of Imperial Guard infantry, now this would normally be a drop in the ocean for starting a new force in traditional Epic 40k, but with Memoir 40k I was able to make up two infantry units, 3 heavy weapon units, an ogryn unit and some leaders. 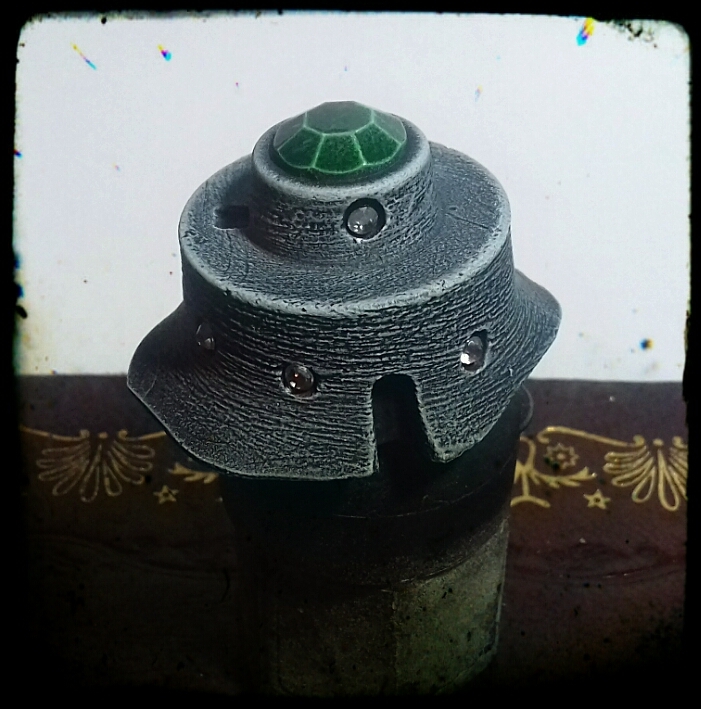 I’ve also been furiously painting up some sci-fi buildings ready for a battle at the end of the week. I bought these from Daemonscape for a very reasonable price and with some dry-brushing and added double-glazing, in the form of some self-adhesive gems, I’m pretty happy with outcome of the test model. 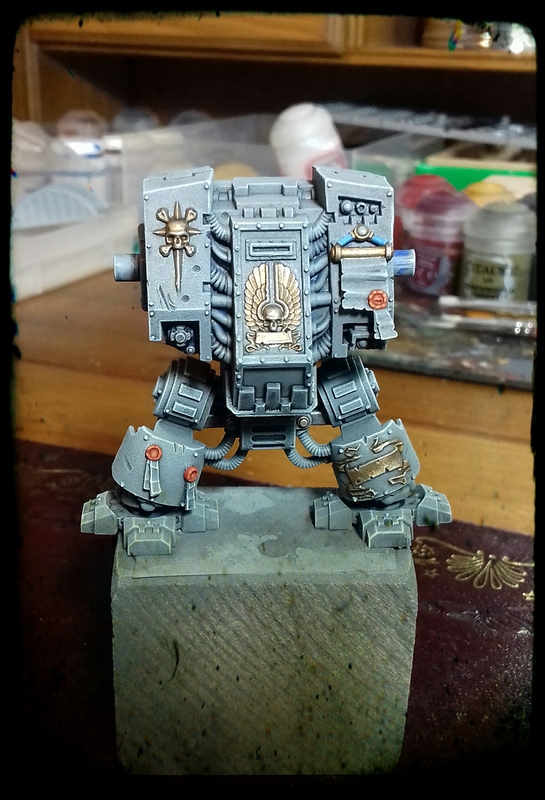 I have been slowly plugging away at my Iron Eagles dreadnought and have finally started to hit my stride. I look forward to sitting down at the painting desk in the evenings and cracking out the paints. 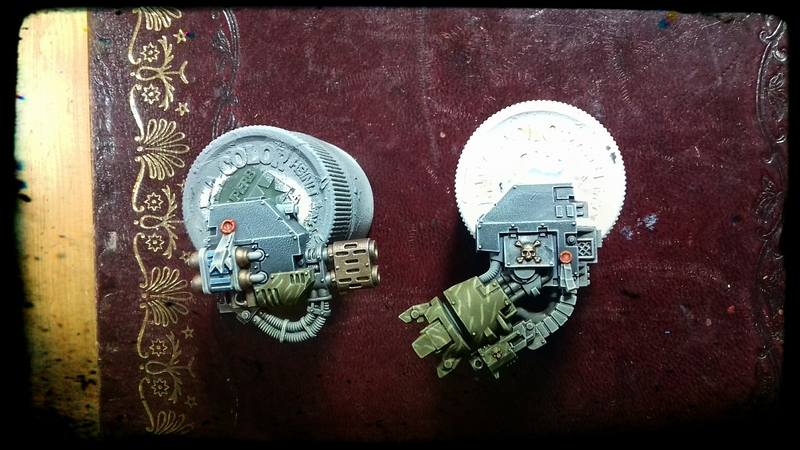 The metallics have been laid down and highlighted, and I am now working on the purity seals.